This is an ongoing experiment - Items will be added as time permits. If you want to go straight to the data, click here. Several have given suggestions about this experiment. Dan T., John R., Eric H. and Steve M. have emailed me comments. Others on the newsgroups, like Mike S., C.H....., and Per A. have made valuable online suggestions. Thanks to all. TODO list: Black iron oxide. Red copper oxide. Calcium oxide. Most logical metal oxides have been tested but there seems to always be another one that pops up. If anyone has suggestions, please send them to ladykate@wichitabuggywhip.com . Prelude (edited from a posting on Passfire). The following might link the tests shown after this section to the real world. Ok... here it is.... the benzoates are better. No doubt about it although my opinion not shared by everyone. However, they have a penalty if you wish to use them. First, potassium benzoate is hard to get in air float and it is hard to mill (generally agreed to). Same with sodium benzoate. However, if you get those two horses saddled, then you are off to the races. Potassium benzoate has good reactivity and less sensitivity to absorbing moisture. I have compared salicylate and benzoate whistles side by side and I think the benzoates sound better and, if you dial them in with your own tooling so you take advantage of their burn characteristics, they out-perform the salicylates. Dan Thames' mile high whistles are done with benzoates. However, Dan has become very adept at this and he could probably make salicylates rock, too. Benzoates really come into their own as second stage and delay whistles. Wow... the sound is throaty and wonderful if you use iron oxide as the catalyst. Copper oxychloride will make them burn faster and have less throatiness so it can be used for the thrust stages. I have just ignited the hair of several who swear by the salicylates - and those who have their hair on fire have a point. Many of them can make award winning rockets with salicylate. But they do it by tuning in the mix with their tooling. An LWS setup is made to use salicylate as the initial increments. It was designed for it and it works wonderfully. Anyone who has seen Steve La Duke's rockets will attest to that. The truth is, it really is rocket science. The burn rates and gas production of the different mixes require you to tune them for your tooling set. You will not get equal results if you interchange them without adjusting something. However, you can interchange them and get results. So what do I use? Well, if I'm using standard tooling or any of Steve's designs, I use salicylate and iron oxide. If I use any of Dan Thames' designs I use benzoates. 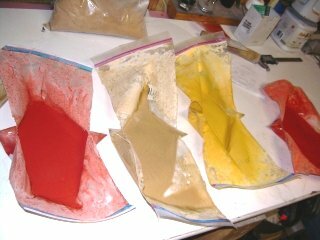 I just made a 6lb tooling set for whistles and have just finished drying some sodium benzoate whistle mix for them. Guess whose spindle design I used for the 6lb set? There are other catalysts you can use with the benzoates or salicylates that will make them do different things. I have tried copper chromite (a bit expensive) with potassium benzoate and it seems to be the most reactive of any of the standard whistle mixes - when used with potassium benzoate only. However, copper chromite is too expensive to use as a standard catalyst (up to $20 for 15 grams). Titanium Dioxide makes a good negative catalyst - that is, the burn rate decreases when you use it. The sound is good so it is effective as a whistle sound only - with little thrust. See my whistle catalyst tests (below). Those tests were done with a specific tool set. Other tools sets might give different results but you can see relative comparisons. This series of observations is meant to compare the sound and thrust that different fuel catalysts impart to whistle mix. Both benzoate and salicylate fuels were used with all catalysts tested with salicylate and many with benzoates. Sandy E. Partin did a similar study called "Vibrational Whistle Rockets: A Study of Catalyst Selection on Performance" Pyrotechnia XVI (page 30). Due to typographical or other errors, some of her study was unclear or ambiguous. The study described here, being a web based one, can hopefully be corrected as it lives on. In any case, please refer to Ms. Partin's work because it has relevant information. 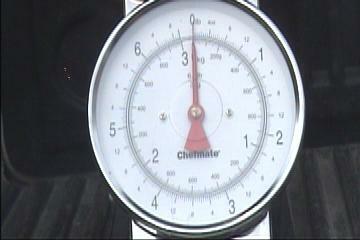 To test the fuel mixtures, a 5/8" rocket motor was selected and was charged with 25 grams of whistle mix. This charge was approximately 1 3/4" long in the end burner motors and 2 1/4" long in the cored motors. Whistle mix is very energetic - do not attempt to make it until you get some experience and you have confidence in how to be safe with it. Never ram whistle mix with a mallet/hammer. Press it using a hydraulic press or arbor press! Here is a video of 500 grams of whistle mix exploding. View it and see what we mean when we say to treat this stuff with respect! Click on the picture above to see the video or click here. Note that the picture above is an un-retouched frame in the video. That stuff coming out at you is unburned whistle. Pretty pyrotechnic, eh? The whistle was made with 76 oxidizer, 23 fuel, 1 catalyst, and +3 mineral oil. Mineral oil or Vaseline is used to temper the burn and to make consolidation of the grain easier. For the modest motors in these experiments, mineral oil/Vaseline was probably not needed but was used anyway. When Vaseline is used, it is usually heated and dissolved in Naphtha. To avoid the dangers of heating Vaseline around whistle mixes, mineral oil was used exclusively. All powders were airfloat or as close to it as possible. The mineral oil was diluted with acetone by about 10 to 1 (the mineral oil does not dissolve - it is suspended in the acetone). Vaseline and its use were not addressed by this experiment. The mix was dried at least 24 hours or until relatively odor free. Note 1: All dry ingredients should be fine mesh (325 or better) for the best results. Note 2: You can mill benzoates in a ball mill but you might have to open the mill and shake the clumps loose frequently. If the benzoate has drawn too much moisture, it will clump up very quickly and be too hard to mill. In those cases, it is best to dry the benzoate in a drying box for a couple of days before milling it. Note 3: The oxidizer was "High Purity" Chinese from Skylighter - 85% -200 mesh and 75% -325 mesh - used without modification for most of the evaluations. Finely ball milled oxidizer (near air float) was tested on three different catalysts (Zinc Oxide, Copper Oxide, Titanium Dioxide) and no significant difference was noted between it and the oxidizer right out of the box. Never ball mill the fuel and oxidizer together for whistle mixes - whistle is too sensitive and an accidental ignition will almost certainly result in a large and potentially deadly explosion. Note 4: The sodium salicylate was powdered and from a private vendor. Most evaluations used it without modification. Some evaluations used ball milled sodium salicylate but no difference was noted between it and the salicylate from the vendor. Note 5: Potassium hydrogen phthalate was difficult to find - lab grade KHP crystals were the only available source. It was very difficult to incorporate adequately into the whistle mix. After several tries, a wet milling operation was devised. This seemed to work - the phthalate results were similar to the other fuels. For the record KHP is water soluble. Generally, KHP was more bother than it was worth - both benzoates and sodium salicylate were more than adequate to meet the fuel needs. Here is an example of sodium benzoate meant for hide curing but not air milled. It looked like fine mesh fuel but when it was kneaded inside the baggy, you could feel grains - generally the feel in the baggy should be similar to very soft modeling clay - no lumps or grains. Above is the full set of tools used to make the test motors. The cylinder on the far left is a 1" plug to make the coreless motors (it replaces the spindle that is currently on the base). The tube in the picture is a 5/8" I.D. tube. It and a few thousand of its peers were salvaged from thread spools. These tools got a good workout! Above is what the tail of a cored test motor looks like. This one has copper oxychloride whistle loaded in it. 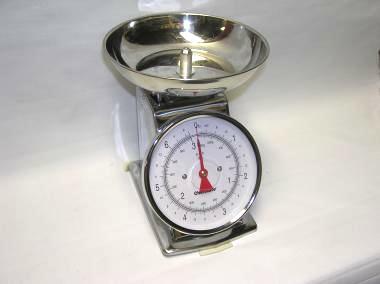 This is the stainless steel Kitchen Chef test stand! 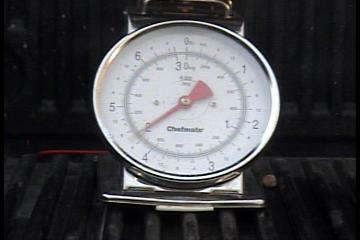 It was selected because a large dial and relatively sensitive (6.6 pounds fully deflects the scale) measurement were needed for the small motors being tested. The scientifically designed deflection bowl at the top was permanently attached and the mount in the middle fits snugly inside the motors. 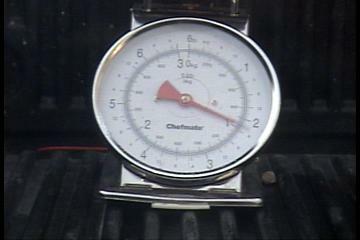 A test is recorded from about four feet away using a Sony Handycam. The movie is then dissected using Vegas 5.0 editing software. The above chart is for illustration of the thrust curve of a pyrotechnic motor with a core. It is slightly exaggerated for clarity. Specifically, the core burn time is usually a smaller fraction of the total burn time. Above is a diagram to interpret the following chart. The data recorded below is not precise and slight differences in thrust, duration, or decibels should not be given much weight. Obvious differences might be useful. For instance, it is obvious that titanium dioxide catalysts make whistle weaker but longer in duration than copper oxychloride catalysts but both are about the same level of sound. For some applications that may not need (or want) the superior thrust of a copper oxychloride mix - a titanium dioxide mix might fit nicely. Static testing the motors was much louder than flying them as rockets. Decibels were measured from six feet away and consistently exceeded 120 decibels - which can cause permanent hearing damage with only momentary exposure. 1/2/2007 Sharp spikes. See phthalate. Lots of spikes and spring bounce on test stand. Sound is higher, less raspy than other catalysts. It is very fast burning. 1/2/2007 Raspy for copper oxychloride. Sharp spikes. See phthalate. It is important to note that the iron oxide used in the tests below was 'natural' iron oxide obtained from Skylighter and, in one case, from Firefox. The iron oxides used at that time were not pure and resulted in a skewed result for iron oxide as a catalyst. Literally, you can add 20 percent onto the below thrust figures if you use a pure iron oxide. Correspondingly, the burn time will be several percent less since burn time is roughly inversely proportional to thrust in these tests. A good example of the difference can be seen when you compare the brown iron oxide - which was relatively pure - to the red iron oxide. The brown oxide is obviously superior. 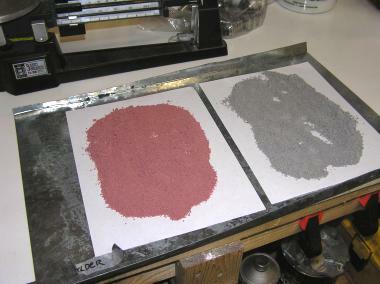 Similar differences between the red iron oxide tested below and 'synthetic' or pure red iron oxide exist. Iron Oxide1 Potassium Benzoate Core Burner 1000 .9 850 <50 134.5 6.9 Iron Oxide 2 11/21/2006 Very raspy start. Speed similar to no catalyst. Brown Iron Oxide Sodium Salicylate Core Burner 2600 .87 1000 (see notes on right) 100+ 133.2 4.27 (see notes) 4/26/2008 Very raspy start and difficult to get good measurements. Shows difference when using pure oxide versus 'natural' oxides that were used above in the red column. Yellow Iron Oxide Sodium Salicylate Core Burner Similar to brown iron oxide (see above). Very good catalyst with salicylate. Lead Tetraoxide Sodium Salicylate End Burner <10 <10 123.2 16.88 11/24/2006 Poisonous Mix - Use protection. Speed similar to no catalyst. Lead Tetraoxide Sodium Salicylate Core Burner 200 2.9 150 <25 132.2 13.1 LeadTetra 11/24/2006 Poisonous Mix - Use protection. Speed similar to no catalyst. Potassium Dichromate Sodium Salicylate End 50 50 127.3 8.51 11/26/2006 Poisonous Mix - Use protection. Speed similar to no catalyst. Potassium Dichromate Sodium Benzoate Core 600 1.35 500 100 135.8 6.6 Dichromate2 12/6/2006 Poisonous Mix - Use protection. Reduces speed of burn. Titanium Dioxide Sodium Salicylate End Burner <50 <50 124.1 18.42 11/19/2006 Very long duration. With air float fuel and oxidizer, the whistle prematurely blew itself out on three occasions. 1 Iron oxide from Skylighter. It has been discovered that not all iron oxides are the same! High grade (pigment 101 or such) red iron oxide is similar to the brown or yellow iron oxide test and much more reactive than some from the hobby suppliers or from ceramic shops. Yellow and brown iron oxide were both very good catalysts..
Fine mesh titanium (-800 mesh) is very reactive and would affect the whistle mix similar to the way other very fine metals, such as dark aluminum, would affect it (bang!). However, larger meshes of spherical Ti (+ 40 to + 200 or so) are most commonly used for a bushy branching sparks effect. The purpose of this section was to see how the more common mesh Ti affected the burn rate of the whistle mix. 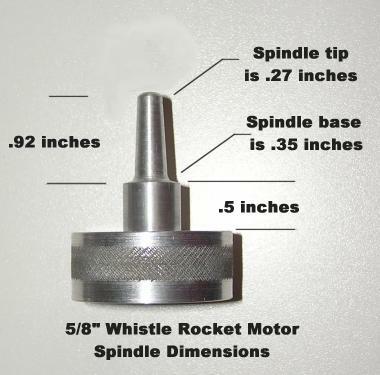 Generally, the best way to load Ti is to pack the motor with whistle mix until the spindle is covered and then add Ti and whistle mix above the spindle - Ti is very hard and will scratch your tooling if you try to compress it around the spindle. For these tests, we gritted our teeth and pressed the mix around the spindle anyway. Titanium +10 Potassium Benzoate End Burner 60 60 128.9 8.9 12/14/2006 27.5 gram load (about 1 7/8" grain). Titanium was 20-200 mesh spherical. Titanium +10 Potassium Benzoate Core Burner 680 1 690 45 131.9 6.8 PlainKB + 10 Ti 12/24/2006 Titanium was 20-200 mesh spherical. Titanium +15 Potassium Benzoate End Burner 70 70 9.1 12/14/2006 Nice sparks - several feet high off of test stand. This and the following would make a nice gerb. 27.5 gram load (about 1 7/8" grain). Titanium was 20-200 mesh spherical. Titanium +20 Potassium Benzoate End Burner 60 60 9.36 12/14/2006 27.5 gram load (about 1 7/8" grain). Titanium was 20-200 mesh spherical. Titanium +20 Potassium Benzoate Core Burner 480 1.4 400 45 132.9 7 PlainKB + 20 Ti 12/24/2006 Titanium was 20-200 mesh spherical. Titanium +25 Potassium Benzoate End Burner 60 60 - 12/14/2006 CATO - walls failed due to heat erosion. 27.5 gram load (about 1 7/8" grain). Titanium was 20-200 mesh spherical. These tests are fun to hash over after a few are made for comparison. For instance, the iron oxide looks decidedly inferior to copper oxychloride but it isn't as bad as it seems when core Total Impulse is roughly calculated using average core thrust and core burn time. Copper oxychloride still has better numbers but they aren't nearly as dramatic (20-30% advantage on core Total Impulse vs. 300% on just peak). What do we mean by core Total Impulse? For pyrotechnic use, the rocket motor often has both the thrust and the delay grains combined. For cored rockets, the average thrust and duration of the core (the core Total Impulse) is a good indicator of motor performance. The "Steady State" thrust recorded in the data (above) is the burn time of the delay part of the fuel and offers much less to the motor performance. However, the higher performance fuel/catalyst combinations could make a useful end burning whistle motor that could lift modest payloads. What is Total Impulse? Maximum thrust is not a complete picture of a motor's performance. While it can explain how much the motor can lift, it is not an indicator of how high the rocket will go. Total Impulse and Specific Impulse should be determined to better understand the performance of the motor. Total Impulse is defined as the time integral of the thrust over the operating duration of the motor or, said another way, Total Impulse is the area under the curve made by recording the continuous thrust levels of the motor burn. Specific Impulse is the Total Impulse divided by the motor weight. See the diagram at the beginning of the data section for a picture ( here ). To learn more about these types of calculations, visit Richard Nakka's site at: http://members.aol.com/ricnakk/th_imp.html or http://www.nakka-rocketry.net/ (if these links are down, use the 'Wayback Machine' at www.archive.org - enter the URLs and you should get joy). 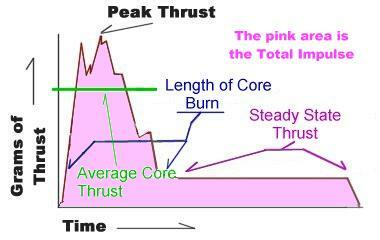 Within limits that were not fully explored in these experiments, the peak, average, and length of burn of the core thrust can be mitigated by increasing or decreasing the spindle height. To illustrate the thrust relationship to spindle length, the following experiment was run using titanium dioxide catalyst and sodium benzoate fuel. The first run was with the spindle used in all the experiments above and the second run was with a spindle that was .3 inches longer. 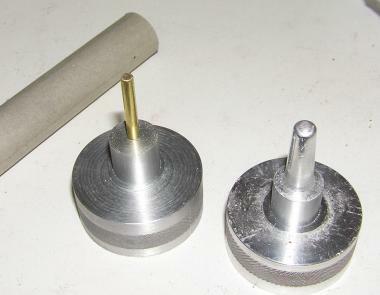 The longer spindle on the right was used to show how thrust can be affected by spindle length. 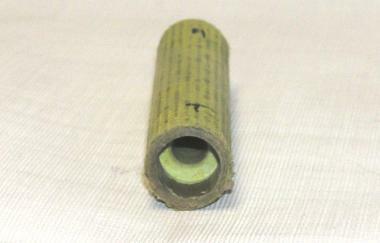 To illustrate the relationship of nozzle width to thrust, the following experiment was run using potassium benzoate and iron oxide as the whistle mix. Within a fairly broad range of spindle diameters - the smaller the spindle, the more internal pressure and more thrust. However it seems intuitive that the pressure buildup should start decreasing as the spindle size goes really small because the burn surface decreases significantly (not tested). The general case - that is, a smaller core gives higher thrust - is validated by the following experiment. There are lots of variables so converting this information to rocket performance is another issue. 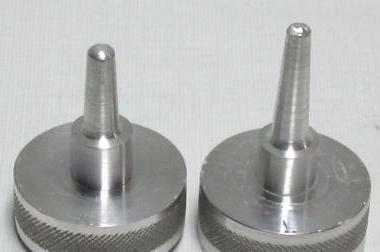 The spindle on the left is 5/32 x 1" . 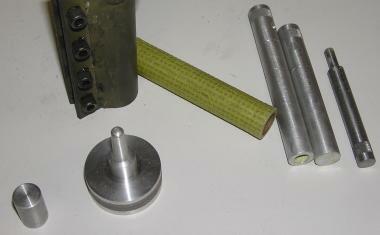 The spindle on the right is a.34" x 1". Some differences were noted in the peak thrust produced by potassium benzoate and sodium benzoate. Some catalysts reacted better with sodium benzoate and others reacted better with potassium benzoate. However, there was seldom a wide variation between the two and the core Total Impulse was similar in most cases with the exception of copper chromite and potassium benzoate which had huge spikes and difficult readings (a retest of this combination is recommended). This implies that either fuel could be used to produce approximately the same results across a wide variety of catalysts. The sounds made by benzoates were usually raspy to start and lower (and louder) than the salicylates - although one exception was copper oxychloride which did not have a significantly raspy start no matter what fuel was used. There were significant differences between salicylate and benzoate thrusts in most cases although one did not always better the other. As with the Partin experiment, copper oxychloride easily beat out most other catalysts in both peak thrust and core Total Impulse no matter which fuel was used. However, most copper oxychloride sounds were higher pitched and sometimes a little weaker than the sounds made by the other catalysts. There was no raspy or throaty start with copper oxychloride.